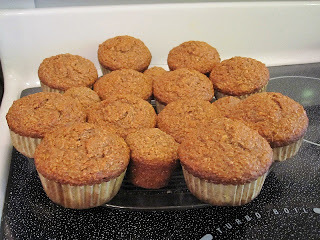 Banana bran muffins are something I have wanted to bake for a while. I wasn’t really sure what to expect. Would it taste more like a banana muffin with bran or a bran muffin with banana? I chose Mother's day morning to find out. I mean what better day to experiment than Mother's Day :)? It's the thought that counts, right? Even if the muffins were a disaster I was covered because my brother’s and I did Mother’s Day up right. They should take the credit for most of the “cooking” but I'll take the credit for inspiring them :). From the beginning I had intended to get up and make waffles and muffins, but knowing that my Mother prefers “breakfast” breakfast my brother’s decided to make eggs, bacon and sausage too. Does it get any better? (well perhaps, there was no peanut butter after all… CURSES!). The recipe is from Robin Hood Flour’s website (really the only brand of flour I use) who are currently running a commercial called "Memories." The commercial has two siblings talking about how they love to bake with their mother because it gives them memories. Their mother explained to them that they should cherish these memories because as they get older it is all they will have . One of those memories is "pigging out on oatmeal muffins" (you can watch it here). I love this commercial, it makes me smile every time I see it. It's also an idea I wish more people would subscribe to. And though not the recipe advertised, it was definitely inspired by it, making these muffins perfect for Mother's Day :). I did make a few changes to the recipe adding some nutmeg and vanilla. However, the most significant changes were to use buttermilk instead of regular milk (I had some leftover) and remove the baking powder in favour of more baking soda. But would you like to know the change that kept me up all night (honestly)? It was the removal of butter (margarine in the original recipe) for apple sauce. I knew for sure that my mother (and probably everyone else) would prefer the butter but with such a heavy breakfast I figured I would be thanked in the long run. I took the risk. Like most muffin recipes, it's easy and quick, but just a few notes. First, it makes a lot of batter, definitely more than the average muffin recipe. I filled the muffin tins to the tops and still had some left over for a few mini muffins. I'd say realistically you could probably get around 14 to 16 regular sized muffins. As well, I won't be using muffin liners in the future as the muffins stuck a bit to the papers. But the most important note is that the flavour of these muffins is absolutely fantastic. 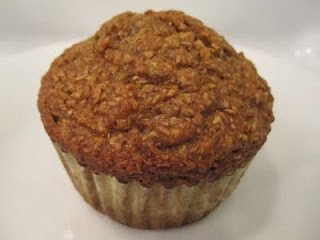 Like a really good bran muffin they are just lightly sweet, but this sweet flavour comes almost exclusively from the bananas. So instead of being a bran muffin with banana or vice versa, it's really the perfect amalgamation of the two. And as far as my nerve racking removal of the butter? These are absolutely, without question, the best applesauce muffins I have made to date. The butter is not needed at all. As it stands, the muffins are tender, moist and light. It both pains and delights me to say that butter would have added nothing. These muffins were the perfect end to an awesome breakfast. In fact they may even become my new goto muffin recipe. 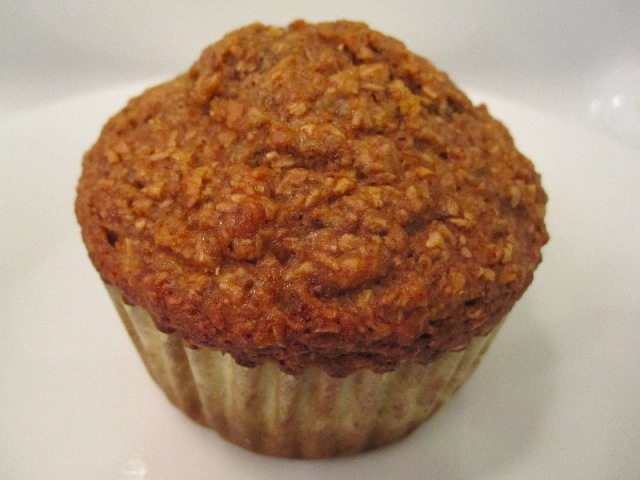 A low fat bran muffin that tastes great? Seems like a no brainer. A pretty significant statement when you consider that, for me, no brainers often become full brainers and then I still have to ask for help :)... and maybe consult a FAQ or two :). Preheat oven to 400F and grease well a standard muffin tin. In a large bowl add wheat bran, flour, sugar, baking soda, cinnamon, nutmeg, and salt. Whisk to combine. -- I followed the recipe and treated the sugar as a dry ingredient. Evenly distribute batter into prepared muffin tin and bake for 18 to 20 minutes or until toothpick comes out clean. Sounds like you cracked the code. They sound like an excellent breakfast muffin, Mother's Day or any day!